This ale pours a very dark amber almost brown with a rich off white almost tan head. Clear but almost completely opaque with reddish hues. Nice dark roosted malts on the nose almost stout like. There are those classic rich nutty toasted malt aromas maybe even a touch of chocolate. Wow, did that just come out of a can? Very rich malty flavors in this beer it taste even better then it smells. The head diminished to just a patchy island in the center of the glass but a nice ring around the glass and some pretty impressive lacing. Sweet caramel taste upfront with a very pleasant smooth and creamy mouth feel and a very nice light hop drying finish. This is a nice Scottish Ale. And at 8% it has a little bit of a kick also. This may be classified as a strong Scottish Ale at 8%. I still can’t believe this exquisite beer came out of a can. Even as this beer warms up it just keeps getting better. Now at 65 degrees it is still as smooth as it was when first poured. Well that was so good I’ll have to have another one as I work on my final thoughts. I am just astonished with this brew. This is an excellent Scottish Ale but it also has a bit of an American twist in the hop taste. It’s not hoppy at all it is just a perfect blend of hops to give you a dry finish to the back end of the caramel malts. Heavier Scottish Ales are known as a Wee Heavy. At 8% this is even a little wee heavy for a Wee Heavy. I can’t find anything unpleasant about this beer. Plus it came out of a CAN! Boy this just goes to show you that you can’t judge a book by its cover or a beer by its container. 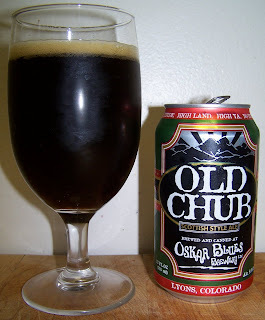 This is the first time I’ve had the Old Chub but I’ve been a big fan of Oskar Blues for some time now. Their Ten Fidy (Imperial Stout) and the Dales Pale Ale are highly recommended. Just don’t pay any attention to that can.